WACO, TEXAS (Janaury 31, 2010) The 38th-ranked TCU men’s tennis team opened its competition at ITA Kick-Off Weekend Sunday with an easy 4-0 win over No. 66 Texas A&M-Corpus Christi at the Baylor Tennis Center. The Frogs persevered through temperatures dipping into the mid-30’s to run their season record to 3-0. The victory sets up a Monday afternoon showdown between the Frogs and sixth-rated Baylor for the right to become one of 15 teams to advance to play in the ITA National Indoor Championships Feb. 12-15 in Charlottesville, Va. Monday’s match against the Bears has been scheduled for 3 p.m. at the Baylor Tennis Center, weather permitting. The Frogs, who had their full roster available for the first time this season, began the afternoon by sweeping the doubles point against the Islanders before taking the first three singles decisions to conclude the match. against Duje Janjic and Robert Raguz. position, posted respective victories of 6-1, 6-3 and 6-1, 6-2.
singles matches go unfinished after the team victory had already been clinched. the Frogs’ top singles player, freshman Marius Cirstea. TCU improved to 6-1 all-time against the Islanders with Sunday’s win. HOUSTON, TEXAS (January 18, 2010) Rice University’s Jason Colwick set a new school indoor record for the pole vault as he cleared 5.62 meters (18 feet 5.25 inches) in winning at the University of Houston's Leonard Hilton Memorial Indoor Track and Field Meet. Colwick's performance is an automatic qualifying mark for the NCAA Indoor Championship and is the fourth-best mark in the world for 2010. Rice’s Chris Kato was fifth in the pole vault with a mark of 4.80 meter (15 feet 9 inches) and teammate Clay Baker placed seventh in the weight throw with a mark of 15.65 meters (51 feet 4.25 inches). 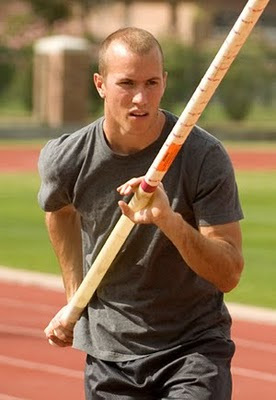 Colwick, a senior from San Marcos, Texas, won the NCAA Indoor Championship with a vault of 5.60 meters (18 feet 4.5 inches) and NCAA Outdoor Championship with a 5.70 meter (18 feet 8.25 inches) in 2009. Prior to the NCAA Outdoor Championship, Colwick had cleared the nation's number one height and fourth in the world for 2009 at 5.72 meters (18 feet 9.25 inches). 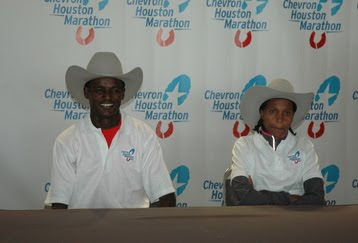 HOUSTON, TEXAS (Janaury 17, 2010) Teshome Gelana and defending women’s champion Teyba Erkesso led an Ethiopian sweep of the 2010 Chevron Houston Marathon, each breaking course records in the process. Gelana, running his second marathon in six weeks, broke away from a pack of five runners at the 22-mile mark and finished in 2:07:37. He cut 15 seconds off the previous record set by fellow Ethiopian Deriba Merga last year. “I did not expect to run this fast. It was unexpected, but I hope the future will bring even more interesting things for me. I think I can run 2:05,” said Gelana. His personal best prior to the Houston Marathon was 2:11:50, set in 2008. Ethiopian Zembaba Yigeze finished in second place (2:08:27), while Kenyan Jason Mbote was third (2:08:58). Erkesso dominated the woman’s race for the second year in a row, crossing the finish line in a course record. Erkesso won by nearly five minutes, lowering her record set last year by 25 seconds with a time of 2:23:53. Russian Margarita Plaksina (Russia) was the second in the women’s race with 2:28:44. Alemitu Abera (Ethopia) was third in 2:31:01. Both Galana and Erkesso received $35,000 for their victories. Antonio Vega (St. Paul, Minnesota) and Shalane Flanagan (Portland, Oregon) claimed 2010 USA Half Marathon Championships with their victories in the Aramco Houston Half Marathon. Vega finished in 1:01:54, setting a new personal best by more than a minute, while Flanagan shattered the course record in the women’s half marathon championship, finishing in 1:09:41. “It felt like just another day, just another practice. It wasn’t until the last 400 meters did I say 'okay, this is a race and I need to make sure I seal the deal,'” said Flanagan, who has her long-term sights set on the marathon. HOUSTON, TEXAS (January 16, 2010) The University of Houston is looking for an offensive and defensive coordinator for their football team. Could recent events at Texas Tech play right into the hands of the Cougars and propel them to the next level? I think so. The Cougars recently fired defensive coordinator John Skladany, and with the departure of offensive coordinator Dana Holgorsen, to Oklahoma State, Houston needs to fill both these positions with people who can step in and fill the gaps immediately. My suggestion is hire former Texas Tech defensive coordinator and interim head coach Ruffin McNeill as the Cougars’ defensive coordinator and former Texas Tech assistant Lincoln Riley as offensive coordinator. Both are coming off leading Texas Tech to a brilliant win over Michigan State in the Alamo Bowl and would be a perfect fit for the Cougars. McNeill would bring credibility to the Houston defense and raise them to the next level. The Cougars spent most of the season with one of the worst defensive teams in Conference USA and spent more time trying to outscore their opponents than stop them. His expertise and the way he relates to players and fans would fit in very nicely to head coach Kevin Sumlin’s overall team philosophy and organization. Lincoln Riley, on the other hand, would bring the experience and knowledge of having worked up former Texas Tech head coach Mike Leach. The Cougars’ offense, which produced the most points (42.1) and yards per game (563.4) in the nation this past season, could continue in the same direction next season and perhaps get that little something extra they next under Riley’s stewardship. In any case, hiring either one or both could take the Cougars to the next level. After the beating the Cougars took from Air Force in the Armed Forces Bowl, Houston had better make their decision quick so they can get back to the drawing board and prepare to put a team on the field that can win Conference USA. LUBBOCK, TEXAS (January 5, 2010) Former Auburn head football coach Tommy Tuberville will be interviewing for the head job at Texas Tech. Athletic department spokesperson Chris Cook has indicted that Tuberville is expected to meet with Texas Tech administrators this week. Also in the running for the job will be interim head coach Ruffin McNeill, who lead the Red Raiders to 41-31 victory over Michigan State in the Alamo Bowl. Tuberville, who was the head coach at Auburn for 10 years, resigned in December 2008. He had an 85-40 record at Auburn, including a perfect 13-0 season in 2004 and a 2005 Sugar Bowl win over Virginia Tech. Before his stint at Auburn, Tuberville revived the football program at Mississippi which was under serious NCAA scholarship sanctions. He also spent a year as defensive coordinator at Texas A&M University when they finished with a 10-0-1 season record. Tech Athletic Director Gerald Myers has stated he may have a decision on the job by the end of this week. SAN ANTONIO, TEXAS (January 3, 2010) There was as much excitement on the sidelines and in the stands as there was on the field at the 2010 Valero Alamo Bowl in San Antonio, where Texas Tech faced Michigan State. Adam James, the Texas Tech inside receiver who is one of the principles in the firing of former Texas Tech head football coach Mike Leach, was on the sidelines and was receiving as much attention as the game. James did not suit up for the game, but was clearly visible wearing his number 82 jersey and sporting a black stocking cap on his head. One man was spotted wearing a hat decorated with pacifiers attached, labeled “Adam James Commemorative Pacifiers." There was also a sign in the crowd with Hance’s last name with a slash through it. Stickers stating “Fire Myers” were distributed by a gray-haired alumnus and were observed throughout the stands. There was even a sign in support of Leach and critical of James, stating “Every Successful Pirate Knows Betrayal” hanging proximately behind the Tech bench. A ten-year old was even spotted wearing a shot taking a shot at James and his family. The ever popular pirate flags and pirate hats, symbols of support for Leach, were everywhere in the stadium and the parking lot, along with Team Leach shirts and other tributes to their former coach. If James noticed all the hoopla, he didn’t act as such. He was seen surrounded by two other non-suited up players and two men in red windbreakers. The red clad men were facing the stands, presumably watching for threats directed against James from the stands. ESPN showed James on the sidelines, but he showed very little awareness of the negativities at the game. Ruffin McNeill: The NEXT Head Coach at Texas Tech? SAN ANTONIO, TEXAS (Jaunary 3, 2010) The Texas Tech Red Raiders showed they can win without Mike Leach at the helm. On Saturday night (actually Sunday morning) the Red Raiders defeated Michigan State 41-31 in the Alamo Bowl in San Antonio. Texas Tech did not seem fazed over the absence of the coach that got them there. In fact, the team seemed to rally behind interim head coach Ruffin McNeill. Could it be that won the game for Leach, even though he was not present on the sidelines? Could it be they won the game because they were playing in their school's 10th straight bowl game? Could it be they won because that was what they were expected to do? Could it be they won because Michigan State had a depleted team, due to the suspension of 12 players and the dismissal of two others? Could it be that they won for McNeill? People can and will debate the reasons for the the Red Raiders' win over Michigan State and the outcome of the Alamo Bowl for years to come. 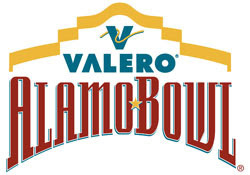 One thing is certain; the 2010 edition of the Alamo Bowl was one for the ages. There was more hoopla at this game since the firing of Leach this past Wednesday. The ESPN announcers were discussing the absence of Leach and the effect it would have on the players, coaches, and the game. McNeill and Lincoln Riley, who was calling the offensive plays, did appear nervous, but who would not be if they were trust into the same positions? McNeill stated in the press conference in San Antonio on Friday that he would be interested in the head coaching position if the opportunity presented itself. The bottom line is the real reason for Texas Tech's win over Michigan State may never be known. One thing is certain. Ruffin McNeill submitted his resume tonight for the job as the next head football coach at Texas Tech. The powers that be at Texas Tech can take it or leave it. HOUSTON, TEXAS (January 2, 2010) Houston’s Robertson Stadium was the site of the first doubleheader of InterLiga 2010, with Atlante facing Estudiantes Tecos in the first game of the evening. In the first game, Atlante downed Estudiantes Tecos 2-1 off of goals by outside defender Daniel Arreola in the 10th minute and forward Guillermo Rojas in the 47th minute. Atlante had 9 shots on goal, while Tecos managed 15 attempts, with Tecos goalkeeper Mario Rodriguez having 3 saves and Atlante goalkeeper Federico Vilar having 4 stops. Atlante had to play the entire 2nd half a man down after defender Jose Daniel Guevara was sent off in the 45th minute for a violent tackle of Tecos midfielder Rubens Oscar Sambueza. Atlante came out hard in the 2nd half, despite being a man down and held off Tecos after Rojas’ goal. Tecos had numerous changes to even the score in the second half, but excellent defense and goalkeeping by Atlante kept Tecos at bay. Both teams were even with five corner kicks each. Atlante lead the game with seven fouls to six for Tecos, and also had more offside calls, 4-1. WASHINGTON, DC (January 2, 2010) Sophomore Jackie Stanley scored 22 points and senior Tara Watts added 16 as the Rice Owls women’s basketball team won its third straight game with a 65-57 victory over George Washington University at the Charles E. Smith Center. The three-game winning streak is the program’s longest since the Owls captured four straight at the end of the 2008 season (Feb. 23-March 6). The Colonials outscored Rice (5-7) from the field, 22 field goals to 19, but the Owls made 18 of 22 free throws, while GW was 5-10 from the charity stripe. 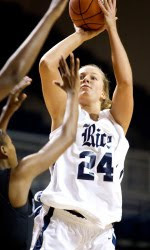 Rice also committed two fewer turnovers (13 to 15) and made 39 percent of its shots to The Colonials’ 34 percent. Stanley made 6 of 18 from the field and was 10 for 10 at the free throw line to go along with 7 rebounds. Watts was hot from outside by making 4 three-point bombs in 7 tries. Junior forward Morgan Mayse was also in double-digits with 11 points and she grabbed 7 boards as well. The Owls also received 8 points apiece from guards Jessica Goswitz and D’Frantz Smart. Smart also had a game-high 5 assists. As a matter of fact the Owls received all of their scoring from their starting five. Reserve guard Amenemope McKinney was 0-1 from the field, while reserve forward Megan Elliott was 0-3 from the field and 0-1 at the free throw line. The Owls were behind 35-32 at the half, but an increase in defensive pressure by Greg Williams’ squad held the Colonials to only 22 points and 26 percent field goal percentage in the final 20 minutes as Rice totaled 33 points. The Owls are now 2-4 when trailing at half-time. Kay-Kay Alums led GW (3-9) with 18 points, while Sara Mostafa scored 12 and Shi-Heria Shipp added 10. Rice returns to Tudor Fieldhouse to host UT-San Antonio (6-5) on Monday (Jan. 4) at 7 p.m.